While traveling home from the Outer Banks we detoured off the beaten path to Knotts Island, via the Currituck Ferry. Our objective was the two wineries operating on the island: Moonrise Bay Vineyard and Martin Vineyards. Our first stop was Moonrise Bay Vineyard which, like many family operations, started as a hobby and grew into an enterprise. Named after the unusually moon “rises” over the Sound, Moonrise Bay produces several styles of wines – from viniferia to muscadine to fruit wines. Richard "Oakie" Morris planted the first vines in 1997 and currently has about 15 acres of vines planted. The winery became operational in 2000, just in time to bottle their initial grape harvest. Together with his wife Kate, they’ve created an attractive tasting facility within the coastal island. Upon arriving at the winery, we were initially surprised to see the breadth of viniferia plantings. But Mr. Morris informed us that the coastal area is well suited for viniferia grapes since the cool breezes cool the grapes during the summer and the water warm the grapes in the winter. We’ve heard similar stories from Maryland and Virginia coastal growers, so in all reality, we should not have been surprised. We started out with what we determined to be our favorite of their offerings: the Grand Ole Osprey White Table Wine. This is a blend of Sauvignon Blanc and Chardonel that has a nice citrus flavor and refreshing acidic finish. This would have been a nice wine to have on the beach. Since this was their only white wine available, we turned quickly to their reds. The Chambourcin was a nice dry, medium bodied wine with cherry and plum flavors; whereas the Merlot had a similar plum flavor but a more pronounced nose and spicy finish. The next two blends were very good and completely different. The Boathouse Red Blend, a blend of Chambourcin, Merlot and Syrah, is dry and complex – full of berry flavors. Although the Grand Ole Osprey Red Table Wine contains the same grapes as the Boathouse Red Blend, plus the addition of Cabernet Sauvignon, it is made semi-dry and is more fruit forward. This wine can also be served chilled and is another nice beach drinking wine. Also made semi-dry and slightly sweeter is their Carlos Muscadine, one of the nicest versions of this style that we have tasted. It has the grapey flavor characteristic to the muscadine and is not overly sweet. For those with a sweet tooth, their two fruit offerings are worth a taste. Made from pure juice from New York State, the Blackberry and Raspberry wines taste exactly like the fruit, just a little more potent. They are not gritty – just rich. We will certainly return to Knotts Island on our next trip to the Outer Banks; Moonrise Bay Vineyard was a great find – both in the quality of their wines and in the ambiance of their tasting room. For those interested in good live music, the winery is hosting folk-rock artist An Evening with Jesse Chong on July 18th. They also host a few other events as well, so check their WineCompass listing for more details. And if you can’t detour to the island, several retail outlets on the Outer Banks carry their wines; see our Wine & Beer on the Outer Banks posting. When traveling to the northern Outer Banks there are several wine and beer attractions worth visiting. The region includes three working vineyards, two breweries, and several excellent wine shops that provide several wine events. Somewhat off the main thoroughfare is Knotts Island, home to two little known wineries: Moonrise Bay Vineyard and Martin Vineyards. The island can be reached directly from Virginia Beach or from the free ferry in Currituck . In the early 1980s, Martin Vineyards planted peaches and Scuppernong grapes, and then moved on to viniferia grapes in the late 1980s. It surprised many that viniferia grapes would thrive on the coastal plain and for quite some time Martin Vineyards was the only successful viniferia grower on the coast. It appears that the surrounding waters warm the grapes in the winter and the constant breezes cool the grapes in the summer. A visit to the winery will offer opportunities to taste estate grown Merlot, Cabernet Sauvignon, Viognier, and Chardonnay as well as muscadine and fruit wines. Their Bay Orchard Apple Wine is awesome. Ten years after Martin Vineyards planted their first viniferia grapes, less than a mile away, the proprietors of Moonrise Bay Vineyard did the same. What began as a hobby turned into an incorporated winery which produces an array of wines from their estate grown grapes. Once again, viniferia grapes are the main focus, with smaller quantities of Norton, Chambourcin and muscadine. Their Grand Ole Osprey table wines are perfect for the summer. Besides the wines, Moonrise Bay provides a few music events in the summer; the best: An Evening with Jesse Chong on July 18th. After crossing the ferry or just traveling south on Route 158, slow down when nearing Jarvisburg (about 10 miles north of the Wright Memorial Bridge) before you miss Sanctuary Cellars and the Weeping Radish Farm Brewery. Sanctuary Cellars is located next to the Cotton Gin on the east side of the road and produces a selection of vintage, blends, and fruit wines, mostly from grapes grown directly from their estate. These vines are easily viewable from the road so you shouldn’t miss it. Currently these wines are bottled at the Moonrise Bay facility, but visitors can see another example where viniferia varieties such as Chardonnay, Merlot, Syrah, Sangiovese, and Cabernet Sauvignon grow fairly well in the coastal environment. In fact the Sanctuary Cellars Cabernet Sauvignon has been rated by national wine magazines. Their medium bodied Chambourcin is one of the sellers as is their two proprietary blends Coastal Collage (Cabernet Sauvignon, Merlot and Syrah) and The Lightkeeper (Sangiovese, Vidal and Chardonnay). Finally, they produce two sweet fruit wines, a Blueberry and a Blackberry made from juice acquired from New York. If you miss Jarvisburg or need to replenish their wines are available (as well as the Moonrise Bay and Martin Vineyards) at the Cotton Gin stores in Corolla and Nags Head and at Tommy's Gourmet Market and Wine Emporium in Duck. On the west side of Route 158 look for the Weeping Radish Farm Brewery, which recently moved to this location from Manteo. The brewery is North Carolina’s oldest micro brewery and follows the “Reinheitsgebot Bier” code where only hops, malt, yeast and water are included in the mash. Their most popular brew is The Black Radish, a Schwarzbier (dark beer) that was listed as "one of the 50 beers to try before you die" by TheBrewSite.com. We also like their Fest beer which also is a great souvenir with a picture of the Ocracoke Lighthouse on the label. The remaining beers encompass the German beer tradition from the Altbier style Farm Brew® made from organic barley, throught the Kölsch, Maibock, Märzen, Weizen beers, to the sweet and malty Corolla Gold lager. Besides brewing beer, Weeping Radish is truly a farm brewery. The complex includes a 14 acre farm that produces vegetables, eggs and herbs that are either sold for retail or used in the brewery’s restaurant. In addition, Weeping Radish signed a joint venture with Gunther Kühle to create their “Farmer to Fork” program. Kühle is a German Master Butcher, who works with local farms to ensure that the animals are raised naturally – grass fed beef and free range pork. He uses his own equipment to produce sausages, hams, roasts and steaks which are vacuum-packed and labeled with the farm of origin. Self-guided brewery tours are available daily and the 30-minute guided tour is scheduled at noon on Wednesdays and Saturdays. Passing over the Wright Memorial Bridge, in Kill Devil Hills, look for the Outer Banks Brewing Station near the entrance to the Wright Brothers Memorial. This brewpub became the only wind powered brewpub in the United States when its 10kw wind turbine became operational on April 22nd of this year - after a six year zoning battle with the local government. The turbine provides 10% of the brewpubs energy and was specifically designed to accommodate bird life. The turbine helps produce one of our favorite beers, the Bourbon-Barrel Barley Wine, which is aged in used Bourbon barrels. The beverage has a heavy alcohol content (10.2% abv.) so it is served in 8 ounce snifters. Outer Banks Brewing Station also produces a wide array of other beers: 10 KW Pale Ale – dedicated to their new 10 kilowatt wind turbine, the Golden Rogallo Ale – made with Belgian Trappist yeast, a Hefeweizen, a Nut Brown Ale, a Kölsch styled lager, and an Oatmeal Stout. With the addition of nightly live music and an excellent restaurant – this is one of the shore’s top attractions. Only a couple miles from the Outer Banks Brewing Station sits Chip’s Wine Market & Wine University. As the name suggests, this retail outlet sells local, national, and imported wine as well as Weeping Radish and other craft beers. It also operates weekly wine classes. The basic class is “Wine Tasting 101: Untangling the Vines”, where for $20, dispels some of the common myths -- about wine. They also provide classes on region specific wines and in June and July look for classes on South American and New Zealand wines. There are other excellent wine shops that provide tasting opportunities. In Corolla, check out Corolla Wine, Cigar & Gourmet, located in the TimBuck II Shopping Village. This shop provides a nice selection of North Carolina wines and a daily tasting of a different wine. The two locations of Native Vines both provide several tasting events. Just before the Wright Memorial Bridge, Native Vines I hosts daily tasting of North Carolina wines for $5 and a Reserve Tasting on Fridays at 6:30 PM (reservations required). In Nags Head across from Jockey’s Ridge - Native Vines II hosts the same $5 tasting of North Carolina wines plus a free Friday tasting of 5 wines from around the world from 6:00 PM to 8 PM. Finally, from June 25 through September the historic Whalehead Club hosts a weekly Wine Festival. Each Wednesday, from 3 p.m. to 7 p.m., the public can sample wines from North Carolina and other appellations and listen to live entertainment, all for $20. Arrive early to climb the Currituck lighthouse – you don’t want to make the climb after a few glasses of wine. 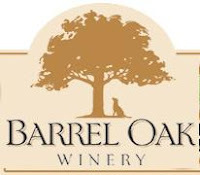 For those staying in town for Memorial Weekend, Virginia's newest winery, Barrel Oak Winery (BOW), is hosting their Grand Opening Celebration. Located in Delaplane, it is one of the closest wineries to Washington D.C. with easy access from Route 66. We have not been fortunate enough to visit the facility, but our pal Dezel at My Virginia Vine Spot visited BOW this spring and from his review - we are looking forward to another excellent addition to the wine family. Expect traditional Bordeaux (Merlot, Petit Verdot, Cabernet Sauvignon, and Cabernet Franc) Rhone (Viognier) and Burgundy (Chardonnay) wines from their estate and surrounding vineyards; but also expect more intriguing varieties such as Petit Manseng, hybrids Traminette, Seyval Blanc, and Chambourcin. And we can't forget the Norton. And for those traveling this weekend, BOW hosts several "TGISunsets" On The Patio throughout the summer and fall. We'll see you there. This weekend we received the inaugural Summer 2008 issue of the Virginia Wine Lovers Magazine and this is truly a fascinating publication. We read the entire issue in one sitting. The guts of the magazine is the Grapevine section which is a listing of Virginia wineries by region plus the upcoming events and festivals - functionality very similar to the Wine-compass.com website. But what made the magazine interesting were the well written articles concerning the history of Virginia wine making, Environmental practices at various wineries, A Fork in the Road which discussed wineries in Fauquier County and the Northern Neck, and Popping the Cork - short articles about food and wine. More publications like this will put sites like Wine-Compass.com out of business. We look forward to the next issue and congratulations to Frank Britt, Randy Thompson, Patrick Evans-Hylton and the remaining staff that assembled such an excellent premier issue. 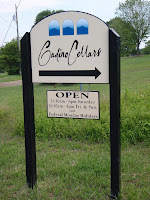 While travelling home on Route 211, we realized we had time to visit Gadino Cellars, located just outside historic Washington Virginia, the oldest of the 28 cities\towns with the name of Washington in the United States. In fact, the town’s current layout was surveyed by then 17 year old George Washington in 1749. Gadino Cellars is owned and operated by the family and their story is very familiar to many other winery proprietors. While living in California, they had become infatuated with California wines and the industry and decided to try their hand in making wine. After making wine as amateurs and moving back to Virginia, the next logical progression was growing their own grapes, which they first planted almost 20 years ago. With the assistance of Lindon Vineyard’s Jim Law – and the partnership of their daughter and son in law, they eventually expanded into the current operation: Gadino Cellars. The winery is another example that viniferia wines can be grown successfully in the state of Virginia. They offer two styles of Chardonnay, a Premium Chardonnay fermented in Franch Oak and a Barrel Select Chardonnay, made in the sur-lie style and aged in French oak for 9 months. The 2006 Premium Chardonnay has an amazing fruity aroma where you could actually taste the chardonnay grape through the nose. It has a refreshing acidic finish that makes it appropriate for meals or after a hike or bike ride. The 2005 Barrel Select Chardonnay is more of a dinner wine, with strong vanilla notes on the nose and palette. No respectful Virginia winery would be without a Viognier offering and Gadino Cellars produces two. The 2006 Viognier is fermented in Hungarian oak for four months and the result is a good wine with a strong floral nose and an orange-citrusy flavor. The 2005 Reserve Viognier is aged in French Oak and has a similar nose but a more vanilla feel from the barrel. This wine also remains on the tongue for a long finish. The final white was the semi-dry Sunset that has a Traminette base with portions of Chardonnay and Vidal Blanc. This wine has citrus flavors, nice acidity, and the usual spicy finish associated with “traminer” grapes. For red wines, there was a collection of Bordeaux styled wines – that were impressive. The 2005 Reserve Merlot was our favorite – full bodied, with cherry flavors and a long vanilla flavored finish; a result of 22 months in French Oak. The grapes for this wine were grown near the Chesapeake Bay where the water warms the winter nights allowing the vines to sustain themselves the entire year. The 2005 Cabernet Sauvignon is a medium bodied wine that has been aged in French Oak. Both the nose and finish contain hints of pepper, but don’t think that the fruit is lacking. This is a fruit forward wine with soft tannins that produce a smooth finish. The 2006 Cabernet Franc - Antiche Viti Reserva is a special wine since it is made from the first vines planted at the estate – over 19 years ago. For Virginia standards these are ancient grapes. It is a medium bodied cherry flavored wine with a long smooth finish. Another fine Cabernet Franc from Virginia. Finally, their Moonrise is a dry, strawberry flavored rose-styled wine made from Cabernet Franc. At less than 1% residual sugar, it is dry – but also contains nice acidity with a somewhat cherry finish. The winery recommends this as your picnic wine and says that it is very popular with hikers and bicyclists after a day in the hills. Gadino Cellars is well worth a visit. The spacious tasting room enables freedom of movement even with large crowds and the outdoor porch area provides a relaxing environment to enjoy an afternoon. The winery will be a regular sojourn along our Route 211 travels. 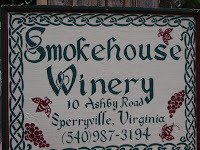 In conjunction with our article on Honey Wine and CCD we traveled to Sperryville Virginia in order to taste the Mead products of Smokehouse Winery. The winery is located at the Blue Ridge Foothills and the drive along Rt. 211 is one of the most scenic that you will find in central Virginia. Upon arriving at the winery and entering the historic log cabin we regretfully found that they only had samples of their Traditional Mead and not the wide array of concoctions we had anticipated: Metheglin, Melomel, Cyser, and Braggot. The later is only a week away - but this served as a valuable lesson to call ahead of time. Our regret was easily overcome. The Traditional Mead is outstanding - possibly the best we tasted on the east coast. Truth be told, the only non-east coast honey wine we've tasted is from Missouri's Pirtle Winery. Smokehouse's Traditional Mead is labeled as semi-sweet, but this is more dry than sweet. It is made from honey fermented with champagne yeast and well water. These ingredients produce an awesome honey wine - one that we enjoyed the whole bottle later that evening. The second factor which alleviated our regret, was that we learned that owner, John Hallberg, is a musician and hosts several concerts at the winery. On Memorial Weekend Saturday (May 24th) he hosts the Shenandoah Shindig which includes local bluegrass favorites the Woodshedders and Furnace Mountain. He will also host a similar concert in August; but look out for October, when Larry Keel is scheduled. This is one show we will not miss. "Imagine a world without honeybees. Now imagine the world without tasty pears, luscious raspberries, and juicy strawberries…" So reads the opening page at Haagen Dazs Help the Honey Bees website. Honeybee pollination is directly responsible for over 30% of our food supply – that’s over 100 crops and does not include indirect contributions to beef and dairy production through alfalfa and other feed products. Alarmingly, the population of honeybees is decreasing rapidly in the United States (37% in 2007). Scientists site several factors, one being Colony Collapse Disorder (CCD), where bees simply leave their hive and die. These scientists are not sure the specific cause for CCD, but they site a few possible causes: viruses, mites, chemical exposure, and poor nutrition. After reading several articles on CCD, we decided to contact several honey wine producers to see how this crisis is affecting their operations. Honey wine, and in particular Mead, is often considered merely a cult beverage served at Renaissance Festivals or Medieval fairs. Yes, honey wine has an ancient history and has been produced in all corners of the globe, from Africa, and Asia, to the more familiar, Medieval Europe. Meads history is fascinating reading and most Meadery websites contain a history page – one of our favorites is at Medovina. However, those that dismiss this beverage are missing out on several tasteful and interesting concoctions. Traditional Mead is made from three ingredients: honey, water, and yeast and can be made into many different styles – no different from grape wine – dry, semi-dry, or sweet. Plus the mead can be produced from different honey varietals, such as clover, wildflower, orange blossom and buckwheat. Honey wine can also take several different forms. Metheglin is mead made with herbs and spices. Melomel is mead that contains fruit, whereas Cyser is mead fermented with apples. Pyment is a fermented combination of honey and grape juice while Melomel is mead blended with fruit. Tej is an Ethiopian version of honey wine augmented with domestic spices. Finally, we learned about Braggot, where mead is blended with malted grains and sometime hops to create a close relative to beer. Quite a variety of styles and in the appendix of this article you can view the large array of products made by the meaderies contacted for this article. Fortunately the current CCD crisis is not affecting the vast majority of honey wine producers that we contacted, although they are fearful of the future – particular rising honey prices. Most mead producers either extract honey from their own colonies or procure it from local beekeepers. These local sources have not been affected by CCD primarily because their bees avoid several known stress factors. New Mexico’s Falcon Meadery and Winery is typical when they state that “Our bees forage on diverse wild plants; there are no large mono culture crops nearby, no genetically modified plants, no exposure to pesticides, the bees are not trucked to farms for pollination and are therefore not exposed to additional parasites, stress and diseases. Plus half of the honey is left in the hives for the winter food source. We take good care of our bees.” This does not mean that small beekeepers do not lose bees. According to Medovina, they can lose 50% of their bees even though their bees are immune from known stress factors. And in Indiana, New Day Meadery’s supplier, Wildflower Ridge Honey, lost several hives in 2007 due to wild fluctuations in the weather. On the other hand, it appears that bees used for crop pollination are more susceptible to CCD. We learned from Medovina that bees are transported across the country in order to pollinate specific crops. For instance, bees must be transported to California to pollinate almonds. Think of the stress on these bees: shipped hundreds of miles in tractor trailers, feeding on one pollen source that has been sprayed with pesticides, at the same time being exposed to mites and viruses from a new territory. And in Colorado, Australian honeybees are being imported to pollinate crops. These non-indigenous bees contain a new source of mites and viruses in which our native bees must build immunity. Unfortunately we don’t seem to have other short term choices in order to pollinate fruits and nuts we savior: almonds, pears, cherries, raspberries, and strawberries. On Friday May 9th we attended the opening celebration for the Land Rover America’s Polo Cup in historic Morven Park, Leesburg Virginia. The main event featured the American and Italian Polo teams competing on Saturday, followed by a concert by the Gypsy Kings and Huey Lewis and the News. On Friday night, attendees were introduced to the polo teams, viewed a fashion show of Americana and Italian models, sampled food prepared by American and Italian chefs, as well as heard the results of the First Annual America’s Polo Cup Wine Competition – the primary focus of our visit. The proceeds of this event benefited Journey for the Cure, a nonprofit, organization created to support research and grants for the MS Society and Leukemia and Lymphoma Society. In addition, a portion of the proceeds will be allocated to help preserve Morven Park, which consists of the historic mansion, museums, and equestrian center. This charitable affair is the labor of Tareq Salahi, who not only is the captain and chairman America’s Polo Cup, but also the owner of Oasis Winery, one of Virginia’s most established wineries. While growing up in the Virginia horse country, Salahi developed an appreciation for polo and wine, particularly since his family owned and operated Oasis Winery. Oasis is one of Virginia’s most established wineries; in fact, it was one of the first wineries to recognize the potential for agri-tourism and providing not only the vineyard setting, but the transportation to attract visitors from the metropolitan D.C. suburbs. Thus it is a perfect match for Salahi to combine his love for polo and wine to assist his favorite charity. After two days of rain, the skies cleared long enough for us to enjoy Friday night. The ground was not surprising soggy, but the valets and grounds crew did a wonderful job shuttling attendees around the mud or covering it as much as possible. The event started with a parachute show by the Spectacular Air Parachute Team, BlackWater USA and continued with food and beverages: our favorites being Breaux Vineyards Meritage and beer from Moretti and Yuengling (America’s oldest continuing operated brewery). Even our friends at Makers Mark attended, dipping whiskey glasses into their trademark red wax. 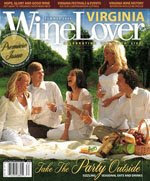 The Wine Competition was sponsored by The Virginia Wine Lovers Magazine, which publishes its inaugural issue this month. The competition was open to all Virginia wineries and the wines were judged by a number of factors: Appearance/Clarity, Color, Aroma/Bouquet, Total acidity, Sweetness, Body, Flavor, Bitterness, Astringency, and Overall quality. The judging occurred April 9th by a distinguished panel of specialists, headed by Dr. Andrew Waterhouse: Chair of the Viticulture and Enology Department at University of California. The beauty of this competition was not necessarily the results, but that it introduced us to new wines and vintages from our favorite wineries. For instance, in the Blush Wine category, we never knew that Breaux Vineyards produced a Syrah Rose (the gold medal winner in this category) or that Chatham Vineyards produced a blush styled wine – the silver winning Church Street Rose. Some of the wines we were very familiar with, particularly the Pearmund’s Pearmund Cellars Ameritage and Cabernet Franc and Winery at La Grange Chardonnay (gold winning White Wine). We’ve also enjoyed the other two white wine winners, Lake Anna Winery’s Totally White (bronze) and Villa Appalaccia’s Simpatico (silver). Our favorite category was the Dessert Wine, in which there were five winners, with one of our favorites, the Gray Ghost Adieu winning Bronze. We plan to seek the remaining medalists this summer: Winery at LaGrange Snort (bronze), First Colony 1607 Edicao Limitada (bronze), Breaux Vineyards Soleil (silver), and the gold winning Williamsburg Winery Late Harvest Vidal. The best surprise was the winner of the Best Red Wine and Best in Show: Potomac Point Winery’s Petit Verdot. Potomac Point opened just last year and makes an impressive array of viniferia wines as well as Virginia’s native Norton. We visited the winery last July and our account is posted here. Since our visit the winery has grown in popularity; for instance Southern Living Magazine listed it as one of the “Best Exits of I95!”. The winery lost a few vines from their estate vineyard last year due to the drought – but their other vineyards are producing fine grapes – particularly the Crozet source for the Petit Verdot. This wine had not been released by the time of our visit and actually, we had no idea it was forthcoming. Fortunately, the Causey’s brought a bottle along and it is an awesome wine – full bodied and fruity. Even after aging 14 months in new French oak, the finish is smooth with low tannins. It was difficult returning to the California table wine that was all that remained by the end of the night. We had to leave a little early before the Gypsy Kings performed and because of family obligations, could not attend the polo match Saturday. We will update this post with other accounts particularly if Dezel's Virginia Vine Spot posts an article. The Land Rover America’s Polo Cup not only supports a worthwhile charity in the Journey for the Cure, but is also an entertaining event – at least the Friday night show. We look forward to attending the entire two days next year. After a nice hike up Sugerloaf Mountain, we headed quickly to the mountain's base to enjoy the rest of the afternoon at Sugarloaf Mountain Vineyard. We have visited this winery on numerous occasions - always after hiking or picking fruit at Butler's Orchard. The writeup of our first visit is available at Compass Tours. We tried two new wines, their Dry Rose and the 2006 Circe. Of the two, we enjoyed the Circe more. This wine is a blend of five Bordeaux grapes and is only aged 5 months in oak. Thus the wine does not absorb much tannins from the wood and is extremely smooth with a short finish. It has a jammy cherry flavor and almost a whole cluster feel; that means intense fruit flavor. The Circe was a nice drinking wine for the afternoon.